After slicing each chicken breast in half, pound them carefully with a meat mallet (protecting the meat with some plastic wrap), until you have a thin filet, preferably less than 1/2 inch thick. You can see photos of the process here. Mix all the ingredients for the marinade (lemon juice + zest, lime juice, olive oil, honey, ginger, and red pepper flakes), whisk well. No need to try and form a stable emulsion, just mix well and add the marinade to the chicken, coating the meat well. Place in the fridge for a few hours or overnight. When you are ready to cook it, remove it from the fridge and leave the filets in a single layer on a baking dish for 30 minutes to bring to room temperature. Right before grilling, season with salt and pepper on both sides. Cook on a hot grill for 6-8 minutes total time, flipping the filets halfway through cooking time, and serve it with lime or lemon slices. Comments: I love many things about this recipe: the citric flavor, boosted by the ginger, the way the small amount of honey ensures gorgeous grill marks with a deep brown tone, how quickly it comes to the table, and how it shines next to many side dishes, from salads to pasta, from rice to couscous. Since I use a high proportion of citric juice to olive oil, at first I was worried that a long marinating time could hurt the meat. This recipe was put to test when I had to change plans for our dinner, and my marinating chicken breasts stayed in the fridge for 2 days! No problem whatsoever, the meat turned out great, with a slightly more intense citric flavor, but no unpleasant “mushiness” from excessive interaction with acidity. Note added after publication: I just saw a blog by Greg for Asian Fusion chicken, and he adds Sriracha to his marinade. Genius! Check it out here. I’ll be trying it next time. This sounds like a very tasty dish though you might want to correct the posted recipe as you list lemon juice twice and don’t list lime juice. 6 times in one month, huh? If that’s not an endorsement I don’t know what is. Ok, I’ll try it. 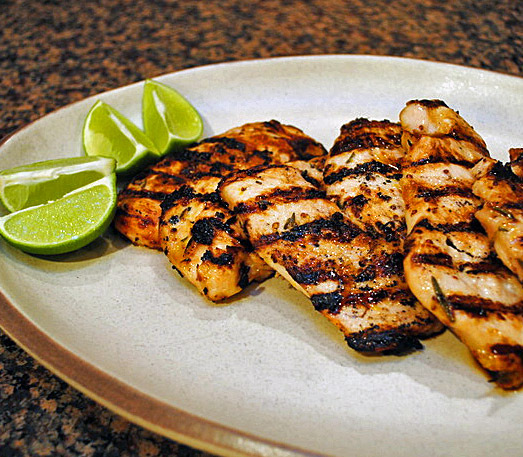 Hey – a tip for pounding chicken breasts: spritz the plastic lightly with a little water before putting the meat on. Acts as a lubricant, allowing the meat to spread with even less chance of sticking and possibly tearing. I know that doesn’t happen too too often, but once in a while you get breasts that are more delicate and prone to denaturing under a good pounding. You know how it is, right? This helps with those. Take if from a man who pounds breasts a lot. Great tip! Thanks, it happened to me in the past, so I’m saving this for the future. Plus, I would never ignore advice of an expert breast pounder! This looks so good, Sally. We rarely grill anything because we live in the fog zone and grilling requires standing outside the backdoor shivering. I do enjoy grilled food at other people’s houses. Thanks! grill marks are like those little blisters in sourdough bread – they open the appetite! Wow, I love the combo of lime juice, ginger and olive oil. Red pepper flakes are so good in marinades. I could eat this six times a week. Thanks for the shout out too. We were, and that means I’m doing something right! Sounds so good, and I think I might like the version with Sriracha too! Okay, that was me above and now I’m testing to see if I have FINALLY figured out how to change my name in my very, very old WP account that I no longer use! Ha! I was a bit puzzled, but now understand the double comments… WordPress seems to be driving lots of folks nuts (me included) with their tweaks and changes of stuff. Wow, brand new grill! Enjoy it… right in time for Memorial weekend! Look at those grill marks!! 🙂 Sally, this looks scrumptious and an ideal weeknight (or any night) meal. The combination of citrus, ginger and honey is simply gorgeous. Love it! Thanks, Kelly! I used a bit of maple syrup in my version last night, and a little mustard. Turned out excellent too. It is a versatile recipe indeed. Love simple dishes like this. It looks tempting Sally.